Earlier this week I posted a picture of the Hotel Dartmouth, which is visible on the right side of this postcard. 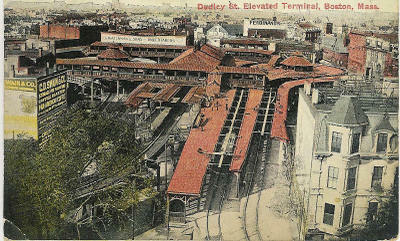 Dudley Station, designed by Albert Wadsworth Longfellow, built by the Boston Elevated Railway Company, and opened in 1901, no longer serves as a rail transit hub for streetcar lines and the elevated train. 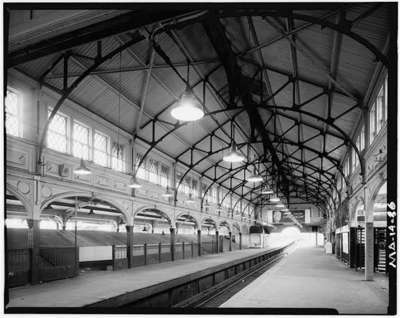 In the early 1990s the elevated station canopy was lowered and moved to its current location to provide shelter for bus passengers. If you look closely at the postcard you see the sign "J. S. Waterman & Sons Undertakers" painted on the side of the building. As of a few years ago one could still see the sign, faded, but visible. Interior view of Dudley Street station Mainline Northbound platform-looking North. Click to enlarge. I love the history of Boston and the towns within it. Seeing these old pics bring back memories. Sometimes change is good. But not alot of changes end up good. But without change, there would be no memories. Thank god for cameras to capture all of our memories.